A neophyte and garden plant which occasionally escapes onto walls and roadsides, but this one is still awaiting its chance in a garden. Grows to 60cm high. This one has flowered profusely. Single flowers atop upright stems. With four orange-red petals 20 to 40mm long, the flower being about 60mm across. The anthers are many and yellow and surround the developing central fruit. The number of stigmas (those things atop of the seed pod) usually number 6, but they can be as few as 5 or as many as 8 (this flower has 7). 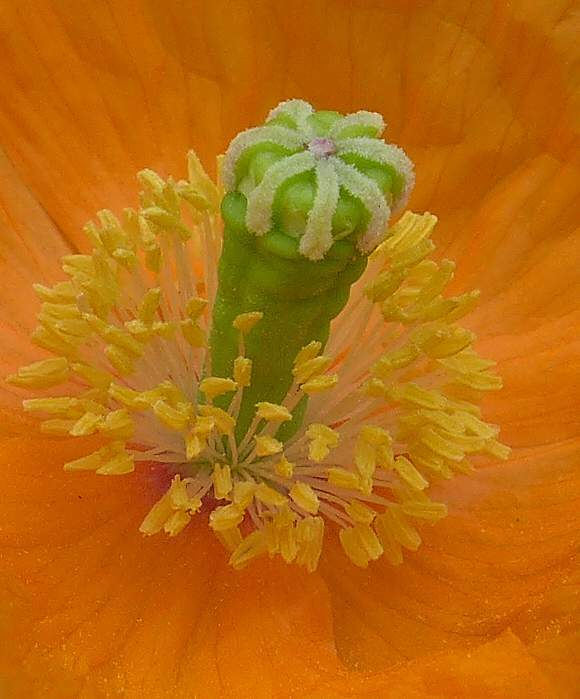 Sepals absent from opened flower. ... but it is tapered to the base and has irregular lumps on it, especially nearer the top. The top is capped by a green stigma which has nominally 6-rays (initially white as here, but they turn purple before becoming brown when ripened). Although the mean is 6 rays, there can be as few as 5 or as many as 8 rays atop the style. This specimen has 7 rays. This specimen has 9 rays on the discoidal stigma, one more than is allowed in the books. There can be the makings of two to three circumferential notches near the summit of the developing seed-head. Perhaps this pod is NOT one from Atlantic Poppy because it has well over 6 stigmas! Upper part very knobbly unlike the seed-heads of Long-headed Poppy. Perhaps this pod is NOT one from Atlantic Poppy because it has well over 6 stigmas! 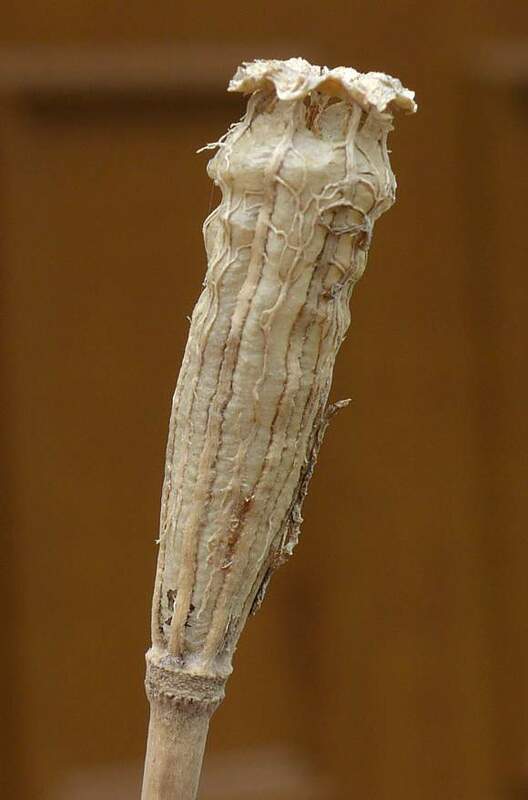 The upper white hairs on the stem are appressed to the stem pointing upwards emerging from tiny white pimples. Perhaps this pod is NOT one from Atlantic Poppy because it has well over 6 stigmas! 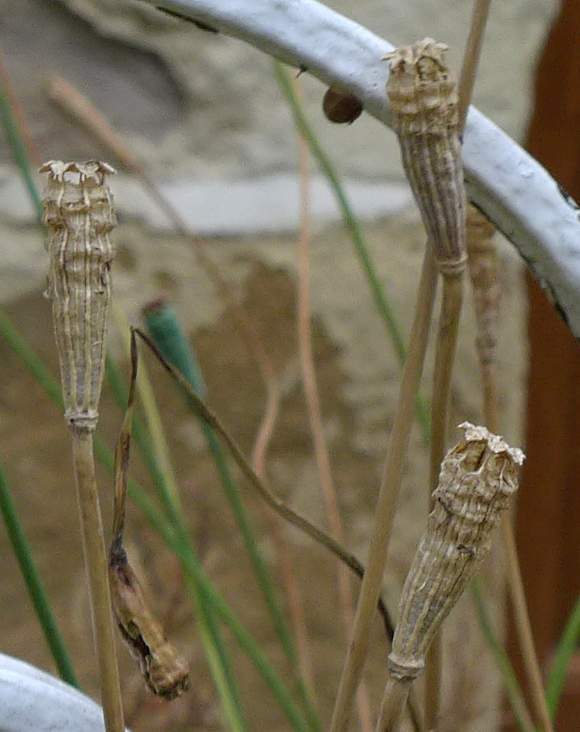 The seed-head turns fawn-coloured when ripe with the upper panels between the visible longitudinal ribs now largely missing, but the discoidal stigma still caps it. The tiny seeds can now escape through the missing upper panels when the plant is blown in the wind or disturbed by passing animals. The knobbly bits near the top still remain, but we can now also see the veins on the outside of the tapering tube. 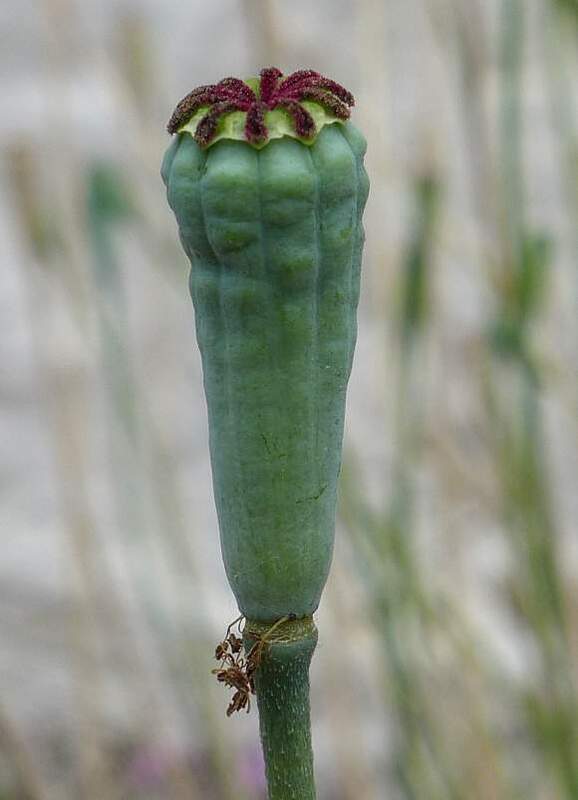 Seed capsule ≤25mm long as is that of Long-headed Poppy. The leaves are irregularly pinnately-lobed and semi-glaucous-green. 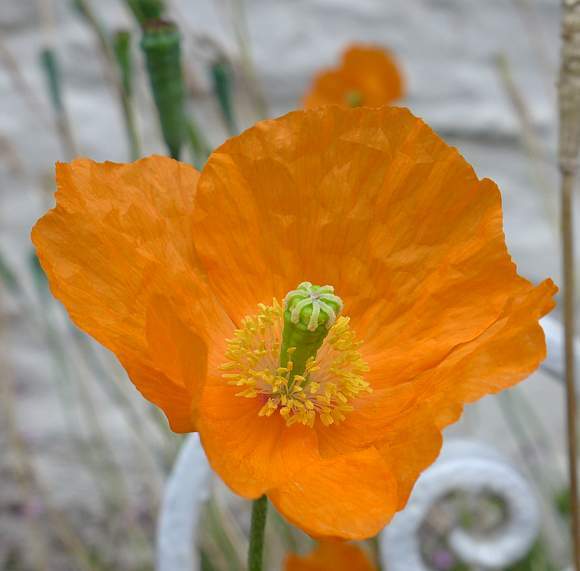 Some similarities to : Welsh Poppy (Meconopsis cambrica) especially any orange versions, but that is usually ascribed as yellow, and with seed-heads, although similar in size, are narrow ovoidal and with a short small round pinnacle atop upon which a 4- or 5-rayed asterisk curls. 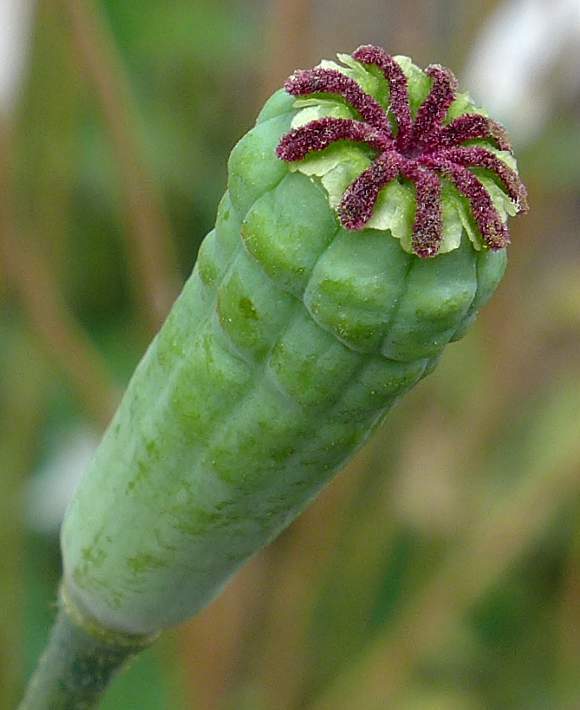 Distinguishing Feature : the knobbles on the upper part of the tapering-to-base seed-head or ripe seed capsule. 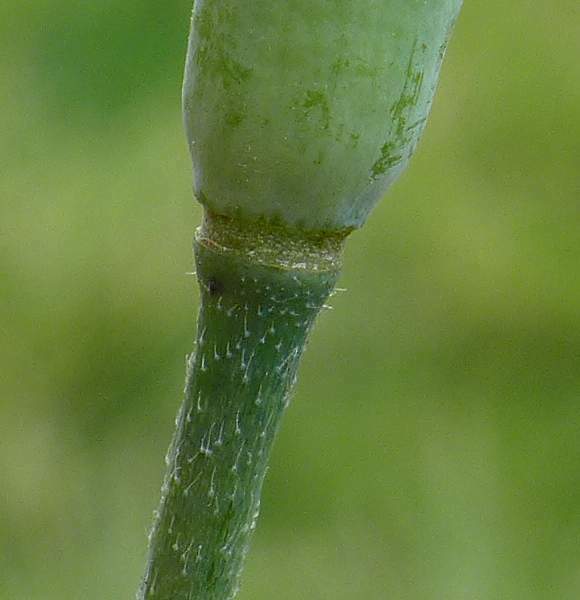 The capsule does not bulge out wider than the stigma cap near the top like it does on Long-headed Poppy. A broken stem weeps a white latex. 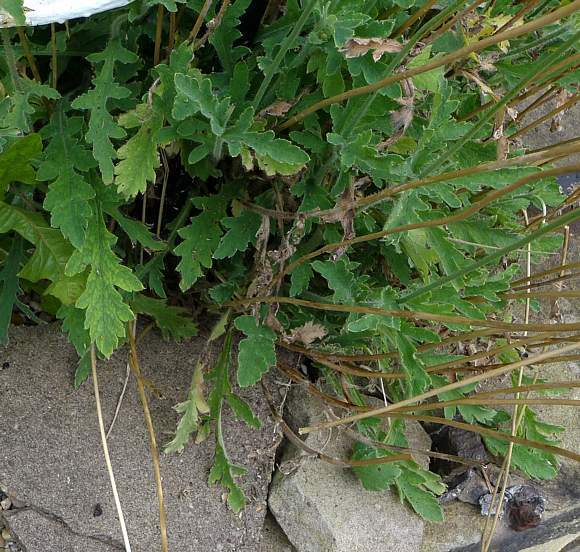 It is non-native garden plant grown in gardens from which it can escape onto the sides of walls, beside the wall, in rough ground or by roadsides. It contains many alkaloids such as Protopine Rhoeadine which are the predominant constituents along with smaller amounts of Stylopine, Cryptopine, Sanguinarine, Magnoflorine, Papaverrubine A , Papaverrubine B , Papaverrubine D (aka Porphyroxine ), Papaverrubine E and the tertiary bases IsoThebaine, Scoulerine and Corytuberine as well as a new quaternary alkaloid 13β-hydroxy-N-MethylStylopinium Hydroxide . 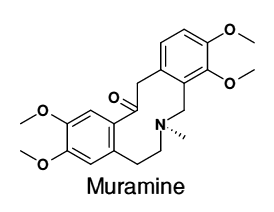 Papaverrubine B and Muramine were also detected. 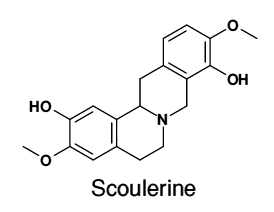 Scoulerine (aka Discretamine and Aequaline) is derived from Reticuline and a precursor to Berberine, all BenzylIsoQuinolines . 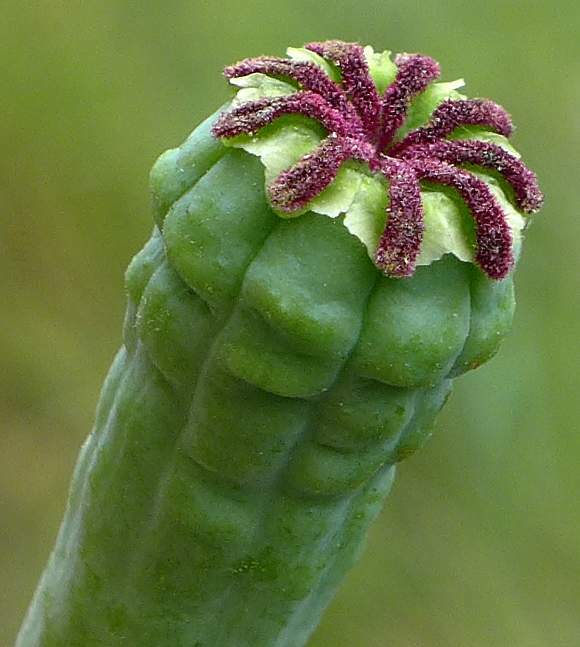 It is found in many plants including Opium Poppy and some plants belonging to the non-native Erythrina genus which is in the Pea Family Fabaceae and in the non-native plant Croton flavens, which belongs to the Euphorbia family. 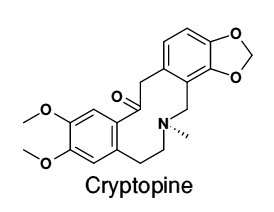 Cryptopine (as well as CryptoCavine [an isomer of Cryptopine] and AlloCryptopine) are widely distributed in the Fumaricaceae division of Papaveraceae. It is toxic. It has a striking colour reaction when a trace of it in Acetic Acid is then treated with Sulfuric Acid: it turns reddish-violet, which persists for several hours before gradually changing to a dirty blue. All of the Protopine alkaloids behave similarly. Muramine has a pseudonym called CryptoPalmitine . Your Author has failed to find anything else about this molecule. 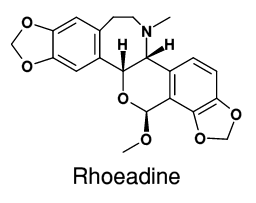 Rhoeadine is generally classified as an IsoQuinoline, albeit one with a 3-benzazepine entity, which is a 7-membered carbon ring containing a heterocyclic nitrogen atom, as do all three of the PapaverRubines depicted here. Despite the slight difference in the way it is drawn (in particular the 7-membered ring) they are all related. Rhoeadine is, apparently, unlike opium, a non-toxic sedative. 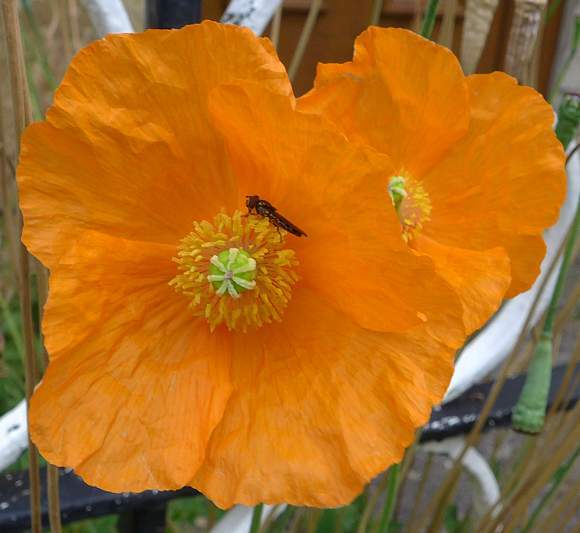 Common Poppy, which contains rhoeadine, was used as a mild analgesic. 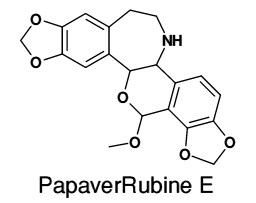 The PapaverRubines have just a hydrogen atom attached to the nitrogen rather than a methyl group of Rhoeadine. All other differences occur in one or both 5-membered rings at each extremity of Roeadine, which are broken (or not) in the PapaverRubines. The PapaverRubines are N-norRhoeadines. 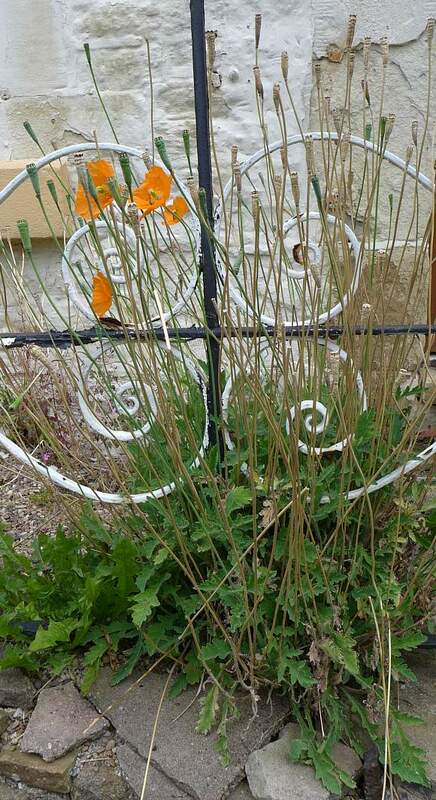 The PapaverRubines have been known from Common Poppy since 1865, but only in the early 1960's was the correct structure ascertained. The PapverRubines (which have N-H) are renown for the deep-red colour when treated with a dilute mineral acid. (By contrast, all N-methyl alkaloids which includes Rhoeadine, when treated with concentrated sulfuric acid turn from red through brown to green). 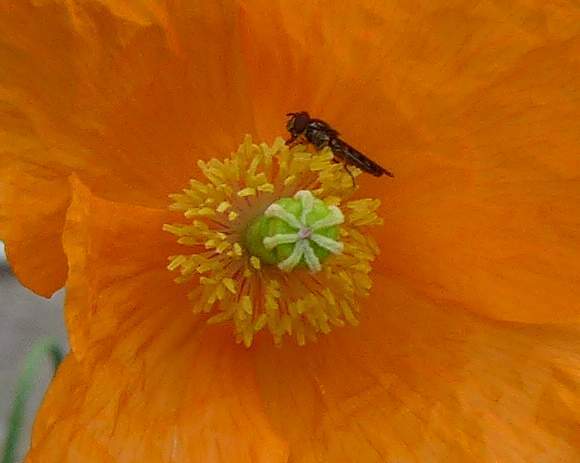 The Rhoeadine alkaloids occur in many but not all species of Papaver and in some Mecanopsis species PapaverRubine A is the same as Rhoeadine apart from the N-methyl being replaced by NH. 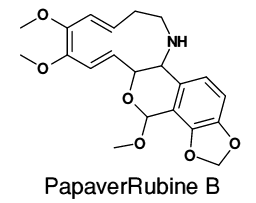 It will be noticed that PapaverRubine B no longer has the 6-membered ring fused to the 7-membered ring: that link is broken creating an 11-membered ring. 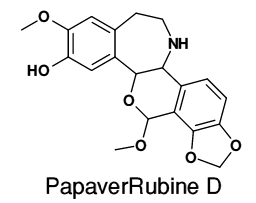 When PapaverRubines or Rhoeodine are treated with a dilute mineral acid the molecule undergoes extensive rearrangement into the red inimium salt of that PapaverRubine. 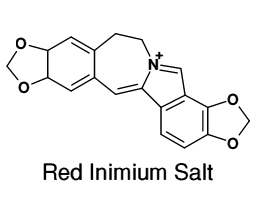 This shows the red inimium salt derived from PapaverRubine A. It is a Zwitterion, with a positive charge on the nitrogen atom because that atom has 4 bonds rather than the normal 3 of nitrogen. The 6-membered ring with the heterocylclic oxygen atom has completely disappeared and a new 5-membered carbon ring fused onto the 7-membered ring to share its nitrogen atom between them. It will attract a negative ion, such as chlorine to form the chloride salt. 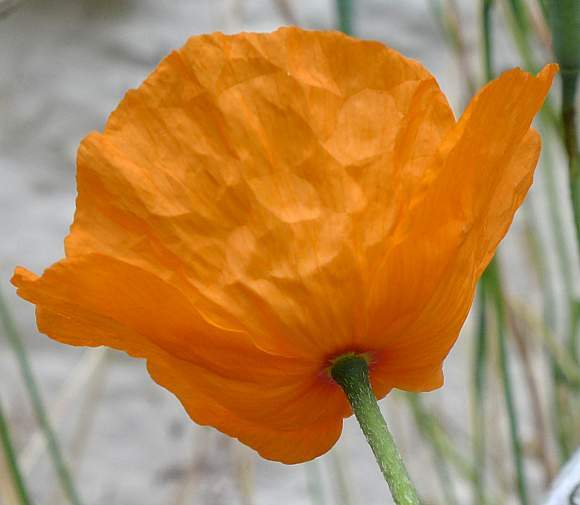 Your Author speculates whether this inimium salt may be responsible for the drying-to-red of the latex in some species of poppy. This red inimium salt has intense calorific value when burned.